I just love having tulips around in the winter. They brighten little corners of my house and make me smile. Even when they are fading, like this bouquet, I think they are lovely. Speaking of lovely, comment emails are working again! Hooray! And even lovelier than that – it’s the weekend. Make it a good one. That photo is a breath of Spring. Soon. Probably not soon enough, but soon. Happy weekend! It’s 10 degrees today and seeing those tulips gives me hope that spring is coming. Happy Weekend! Beautiful! My last batch didn’t really bloom…we’ll give it another try this weekend. (Doug did buy me a flower bouquet though!) Have a nice weekend Carole! So pretty. Have a great weekend! The colors of spring tulips are certainly welcome in the cold and snow! I shoveled yesterday, but with all the fierce wind, much of it needs to be re-cleared today and I think I’ll reward myself with something blooming after I get that done. Happy Weekend! 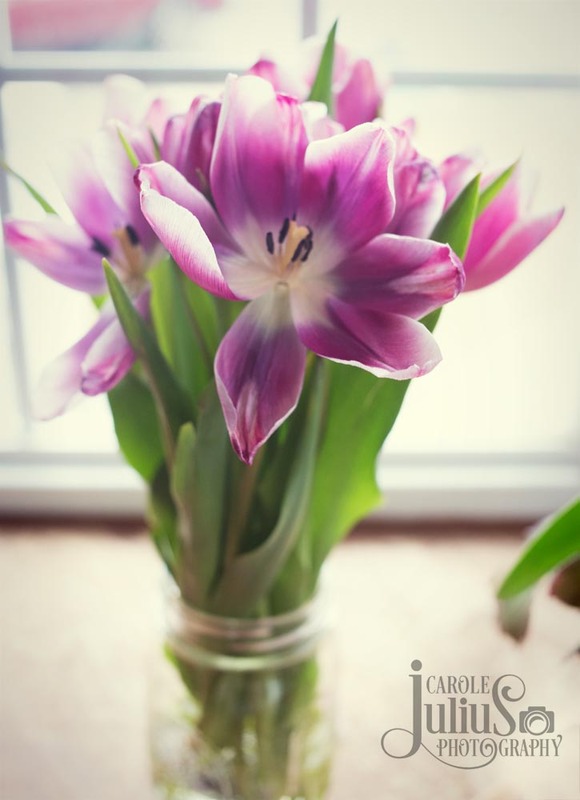 Tulips are a beautiful foreshadowing of spring! Have a cosy weekend! So, so very pretty! I love the color. I know spring is starting her fight to come in and she will be interrupted over and over, but she will persist! Spring is coming!!! Those tulips are beautiful! Have a great weekend. Purple tulips! and yes, let’s make it a good one! So pretty, and yes to the weekend.